“I studied at the University of Westminster in London during the fall of 2014. My time abroad was absolutely incredible. I lived in a dorm with students from Germany, Spain, Italy and America. During my study abroad semester, I traveled across Great Britain as well as four other European cities with the new friends I made. 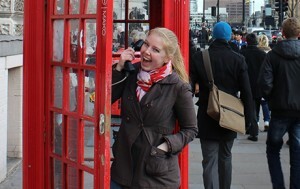 I took interesting classes in London and was able to learn more about cultures beyond my own. My friends and I made it our mission to explore every corner of London, from museums to pubs to markets. Because I am a nursing major, some people told me it wouldn’t be easy to study abroad, but I’m here to say that with a little determination and help from Ramapo faculty and staff, you can make it happen.” – Brook Tweeten ’17 graduated with a B.S. in Nursing.